Showing 13 articles from February 22, 2015. 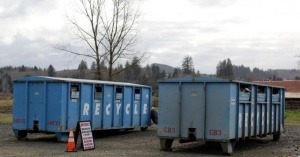 Need to recycle and can't find a location? Andrea Keller is among friends and family during the Valentine Ball and Benefit in her honor. More than 200 people attended and danced the night away and raise over $8,000 for Andrea. 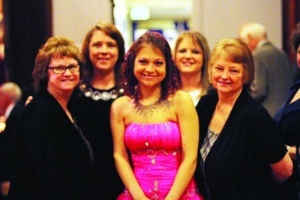 The adult prom night held on Valentines Night by friends of Andrea Keller brought a community together to help raise money for a friend in need. The Northwest Carriage Museum is pleased to announce as of March 1, doors will be open daily (year round) from 10-4 pm. 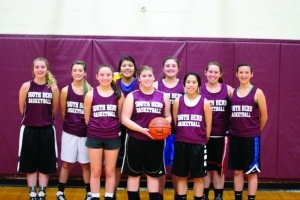 Under the direction of Coach Gary Wilson, the South Bend Girls' Basketball Team took this year into District IV facing Wahkiakum in the first round and Willapa Valley in a final battle in the second round of play. This year's team finished with a Pacific League record of 4-6 and an overall record of 9-12. MONTESANO - The Raymond girls have just done battle with Toledo on Monday, February 16 at the Montesano gym and on their way to this district match they already have had one up, and one down. 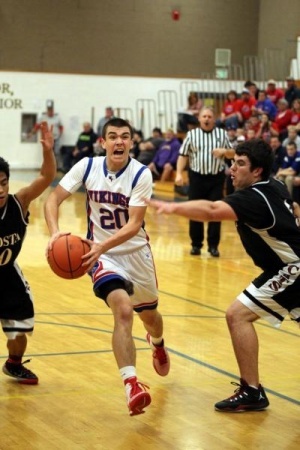 Viking Hunter Gray makes his way through the Wildcat defense of Caleb Tackett during the third round of District IV basketball play. Ocosta took the game ending the Vikings season. ROCHESTER - With the Raymond Seagulls boys watching in the stands to see who they would face next, the team from Willapa Valley ran onto the hardwood to take on the Wildcats of Ocosta. Weight Watchers meetings are every Thursday at the Pacific County Annex, 1216 W. Robert Bush Drive in South Bend. Weigh-in is from 11:30 a.m. to 12 p.m., and the meeting follows until 12:30 p.m. To sign up visitHYPERLINK "https://wellness.weightwatchers.com/"https://wellness.weightwatchers.comCompany ID:49518, Company Passcode:WW49518, Help Hotline: 866-204-2885. For more information, contact Denise Rowlett at 360-581-5249 or email HYPERLINK "mailto:drowlett77@yahoo.com"drowlett77@yahoo.com.